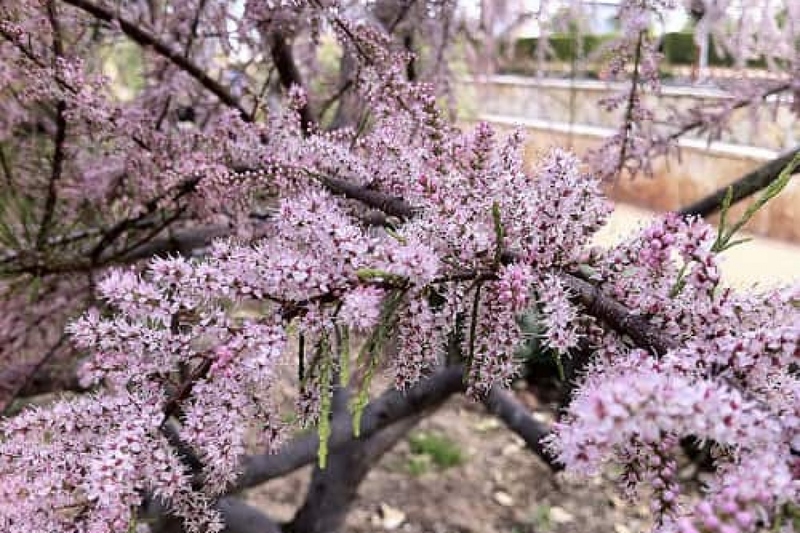 Tamarisk (Tamarix): growing, planting, caring. Resistant to spray, drought, disease and sunlight, tamarisk is a solid shrub. It is covered between April and September with a multitude of pink flowers that partly conceal its leaves in scales. Tamarisks are deciduous shrubs or trees growing to 1–18 m in height and forming dense thickets. Tamarix aphylla is the largest, growing up to 18 m tall. They usually grow on saline soils but can also tolerate alkaline conditions. They are characterised by slender branches and grey-green foliage. The leaves are scale-like, 1–2 mm long, and overlap each other along the stem. They are often encrusted with salt secretions. The pink to white flowers appear in dense masses on 5–10 cm long spikes at branch tips, sometimes entirely covering the foliage, usually from spring to autumn. Water only the first weeks of the installation, or if your tamarisk is in pot. In both cases, wait until the soil dries on a few centimeters before watering again. After a few years the shaggy branches can become a bit too exuberant. There are two types of pruning for tamarisk. - Prune flowering tamaris every 2 years after flowering. Thin out by cutting some of the old branches at the base. - Summer blooming tamaris are easier to cut. Every year in March cut all branches as low as possible - if possible at ground level. If you want to make your tamarisk a tree, cut only one carpenter out of two beside the trunk.